The merciless criminal Kain has escaped from sub-space where he has been captured! Kain, who was deprived of his freedom by the Jurai royal family and Galaxy Police, has demolished the Galaxy Police headquarters, and attacked the Jurai King. His next target is Earth! Around the same time on Earth, Tenchi's house has suddenly disappeared. What's even worse is that Tenchi's body is disappearing too! Something must have happened in the past to Tenchi's mother, Achika! So the gang must now leave for a journey to the year 1970. This anime is a great piece of work. If you've seen the series on TV then you'll love this movie. This is the first of a three-part trilogy, since it is the first movie made from the television show they made great strides to impress the fans with its great artistry, and plot that keeps you glued to the couch. The characters in the story are hilarious, with some sadness towards the end. The movie is full of jokes corny and can be sexual, but Ryoe Tuskimura (the writer) does a great job keeping the story going and show the love between Tenchi and his mother who died in the past. Chistopher Franke, the composer, does a stupendous job making you feel the love the story shows. Tenchi with his problems and with six girls, including two who fight over him all the time, makes this story comical, along with a evil villain who doesn't need to be seen till the end makes the climatic battle more enjoyable. 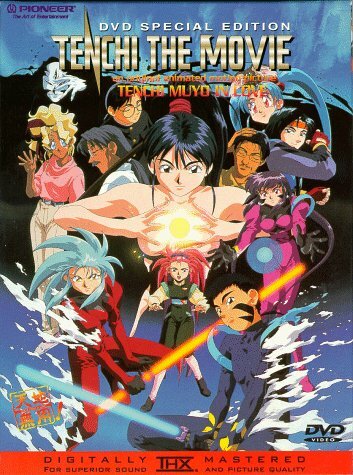 The evil villain in the beginning does something in the past that involves Tenchi's mother; Tenchi will disappear if Ryoko, Ayeka, Washu, Kiyone, Mihoshi, and Sasami don't help him find his mother who died before Tenchi was old enough to remember her. The go under cover in a 1970's high school to find and protect Tenchi's mom, along with getting his dad and mother to get married. When everything seems to be going well a weird personc ontinuously follows the group around, the man looks odd and seems to know something, but what? This is a great animé comical thriller. The images are wonderfully drawn; the animation is immense with wonderful design of the characters and beautiful scenery shots that help set great backgrounds for the characters to live in. This is the first Tenchi Movie is in 5.1 Dolby Digital quality which made the orchestrated music sound perfect for each scene. The audio comes out crystal clear, you can even understand crowds of people in the background. An Interview with Composer Christopher Franke can be found in the extras. He talks about how he found the music for each show, and you see him playing the music to some of the shots in the movie. They also have the Theatrical Trailer and TV spots, which are in Japanese. And the final thing that really stands out is in the Production Notes. It shows shots of the characters that are pencil drawn and sketches of the background, a great thing to go through to see how they map out all the great scenes. This Anime is a great DVD to have; this is a movie you could watch over and over again. It was written perfectly to capture the viewer. I love this movie. This movie along with the music makes it a must watch, there is no reason to not see it as it is as good as any great live action movie.